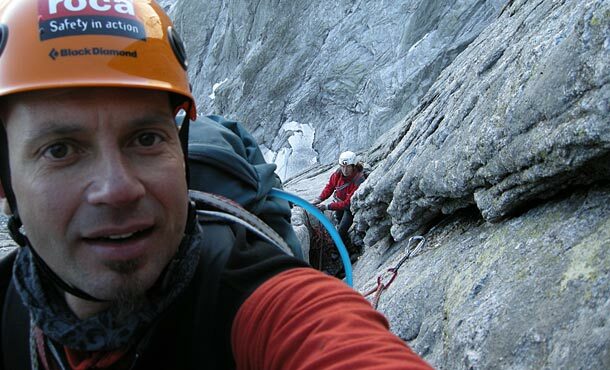 The famous Via Cassin is one of the six great north face routes in the Alps. Today it is still a long and serious tour with an alpine character and unique beauty, its story about the first ascent is part of the history of mountaineering. On the sunny July 14th, 1937 Riccardo Cassin and his two partners, Vittorio Ratti and Gino Esposito, started to climb the wall. After their first bivouac, they teamed up with Mario Molteni and Giuseppe Valsecchi, who also climbed in the wall by that time. On the second day, they climbed the technically most difficult passages in the middle of the wall and bivouaced at the bottom of a number of chimneys, where they were soaked in a heavy thunderstorm – torrents poured over the granite, the hail layed on the ledges. On the afternoon of July 16th, the five finally reached the summit. But during the descent on the south side of the mountain, Mario Molteni and Giuseppe Valsecchi died of exhaustion. 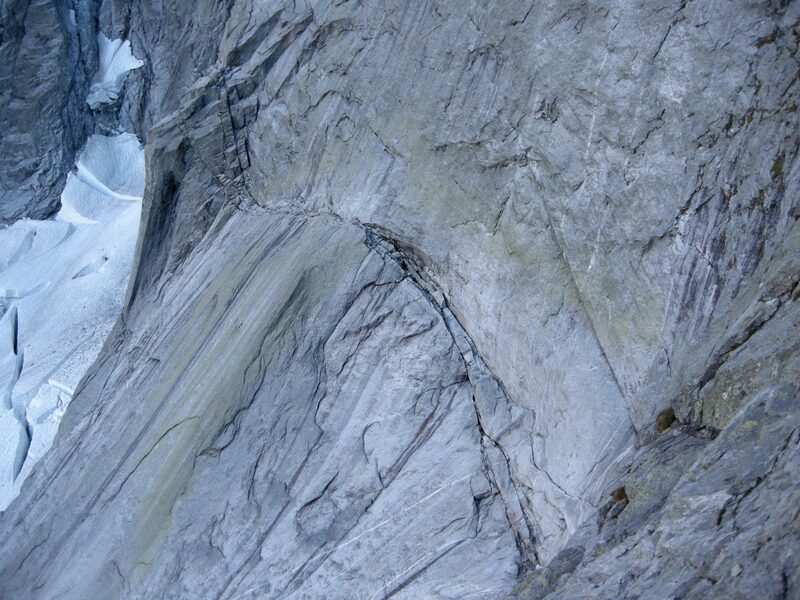 This first ascent became famous. Not only because of this tragic event, but also because of the difficulty of climbing, which was at the limit of possibility by that time. 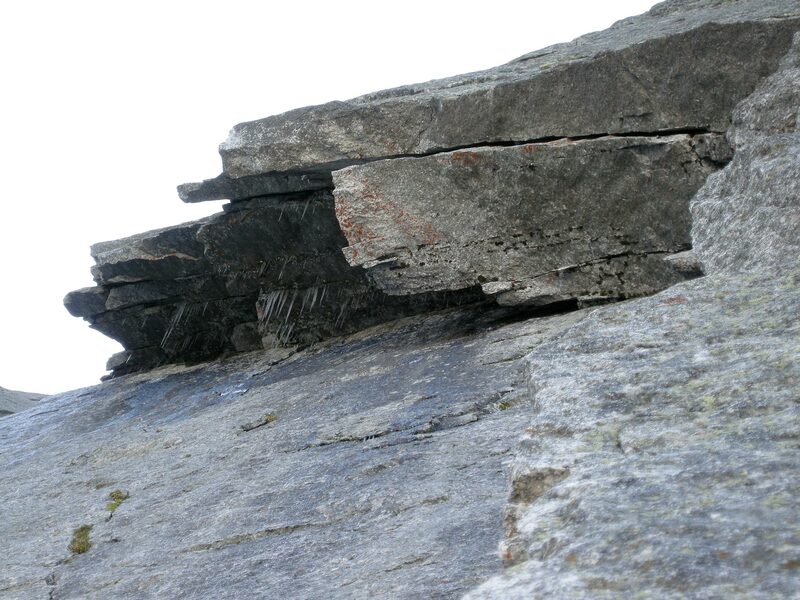 It is the well solid and structured granite, which separates this wall from other north faces. 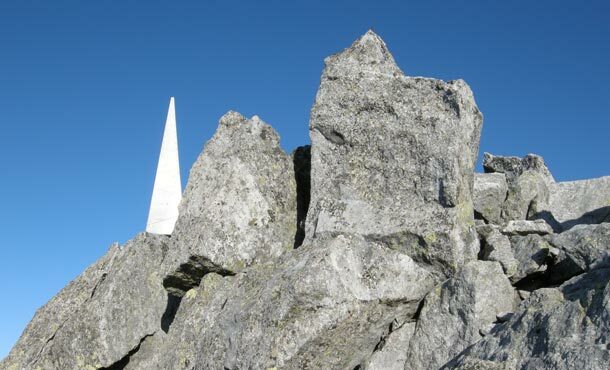 Especially impressive are the compact, funnel-shaped slabs of the over 700 meters high northeast wall. It is a funky feeling to climb this huge wall, which appears unapproachable from the ground. 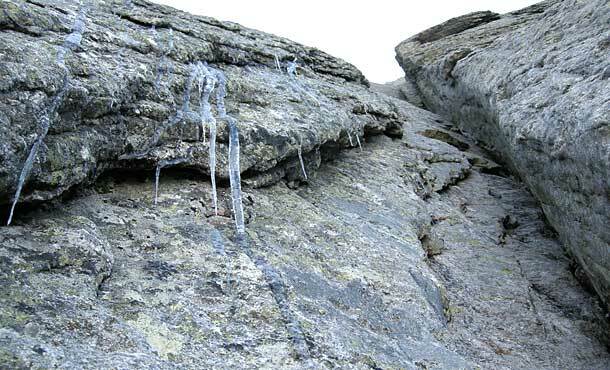 During the climb, the smooth-looking wall breaks up in ledges, cracks and structures. Despite the occasional pitons, it takes a lot of know-how to place the correct Camalot quickly to the appropriate slot. 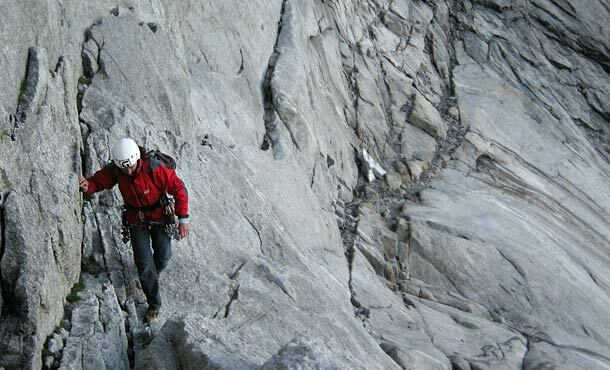 The tour is long and requires rapid movement, but therefor it offers also great climbing. 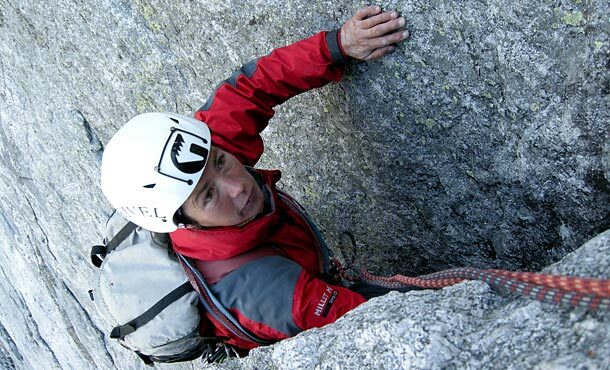 Alpine experience and a good intuition for the pathfinding are necessary to find the best way through the wall. The season is short for such a long tour on Piz Badile. It is good feasible after mid-July when the snow sufficiently melted away at the bottom of the route. But after the first cold air intrusion in September, the wall can quickly disappear in its winterly white. 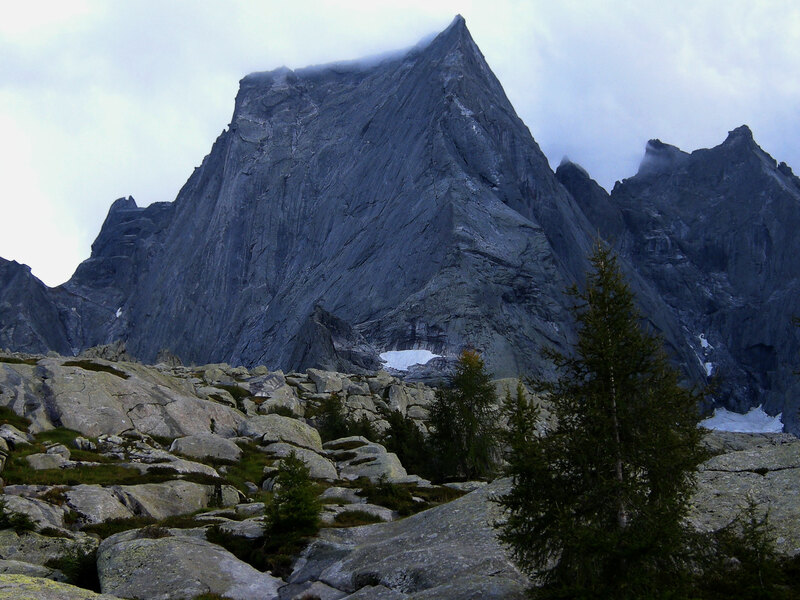 In addition, the peak with its height of over 3300 m is high enough so that any thunderstorm can bring snow. After that it takes several days, until the granite is dry again. 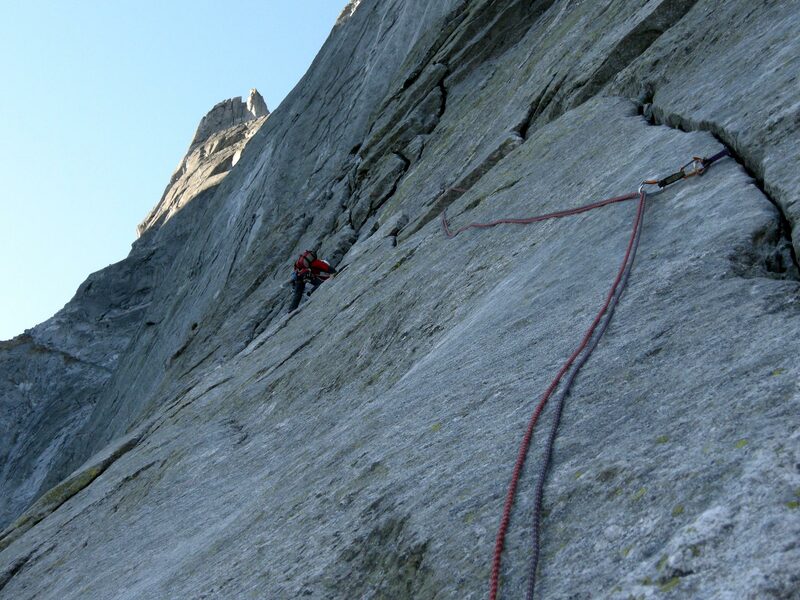 And if the summer is as changeable as this year, there are only a few occasions left for a climb through the northeast face. We started on Friday morning at 7 am. After an 8 hours drive we arrived the tiny village of Bondo (823 m) and the parking lot of Laret over the Maloja pass on the Swiss side, our starting point for the one and a half hour walk up to the Campana Sasc Furä (1904 m). The alarm rings on Saturday morning at 4 o’clock, and the adventure begins. 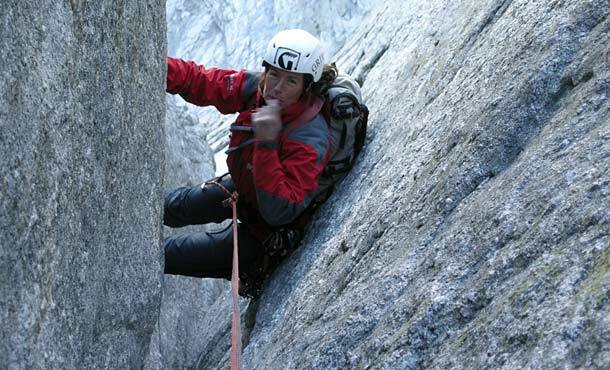 We start for the two hour walk and at 7 am, we finally reached the bottom of the wall at the famous Rébuffat crack – the first pitch of the Cassin route. We are the only couple in the entire wall that day, which doesn’t surprise as a cold front was forecasted. Starring right at the wall, we are not sure whether to climb it or not: we see loads of water strips, which are all iced. Today the conditions seem to be harder than expected. We decide to give it a try, keeping the option for a return in mind. The day takes its course. Pitch by pitch we climb up the wall – passing the two bivouac sites where Cassin spent the nights in 1937 together with his partners. After 15 hours of climbing through well-structured granite, partially iced slabs and through frozen chimneys, we finally reach the summit of Piz Badile and thus the Bivacco Alfredo Redaelli at 10 pm. We are happy to escape the cold of the night. On Sunday morning at 7 o’clock we leave the bivouac. After 4 hours of scramble and rappelling we reach the Rifugio Gianetti (2534 m). From there we continue further south to Bagni Masino into the Val Masino – a very exhausting descent. A group of nice Italian climbers give us a lift via Morbegno and Chiavenna back to our starting point in Bondo, which we reach at 4 pm. From there it is still 8 hours back home. At midnight I am happy to unlock the door of my apartment. Now the weekend is over and we have experienced another adventure. From Maloja-pass to Bondo and into the Val Bondasca to Laret. From here in 1,5 hours up to Campana Sasc Furä. End of July to beginning of September, but not on weekends. The Bergell area is famous for its thunderstorms at afternoon – also here, speed means more security! The belay anchors are mostly made with expansion bolts, anchors inbetween must be placed by yourself (there are a few pitons). The protection with mobile devices is good, but sometimes with long distances. 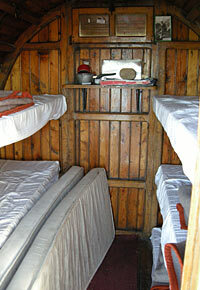 There are several descriptions and guidebooks of Via Cassin.  I believe that the most accurate topo is “Schweiz plaisir sud” by Jürg von Känel, which provides more details than, for example, “TopoGuide”, “keepWild” or “Nichts als Granit”. 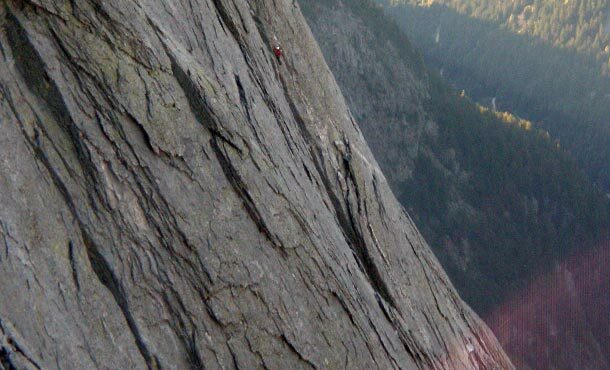 The descent on the south side shouldn’t be underestimated, because most accidents happen by rockfall while descending.